This bottled incarnation of Gahan's IPA has lots of sticky, pale-amber head that lingers for a while before leaving some lumpy, sticky lacing on the glass. It is still clearer than the pub's version (which should change soon, as they're working on product consistency). The cloudy (and best-ever, from August) version of it seen below is a little cloudier than what you get at the pub now. The beer is a deep, clear rose-amber. There are nice aromas of grapefruit and some other citrus, a bit of evergreen, and some slight malt / caramel notes. In the flavour is some nice pith and grapefruit. It's fairly well-rounded, albeit a bit green / grassy. There is some cracker / bread / grain to it. 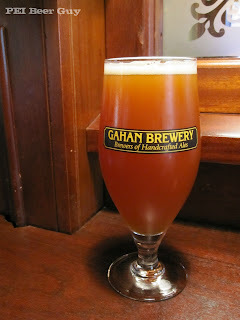 It has a "summer ale" slant to it in that there are also ever-so-slight hints of lemon & pepper. The finish is fairly bitter and a bit grassy, as well as slightly sticky. The body is medium, and the carbonation is pretty light (just right). There are some hops in the burps, which is nice - sounds gross, but those that understand know what I'm talking about. 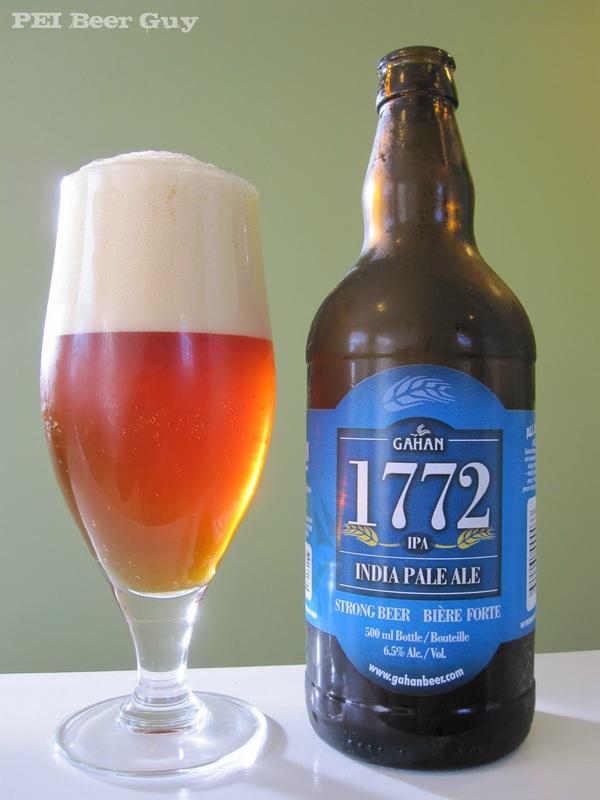 The 6.5% is apparently the strongest beer that can be brewed legally on PEI (let's hope that changes). I actually think it has a bit more of a kick than 6.5%... I wonder if it's just labelled 6.5% and it's actually a bit higher (there is a 1.5% "fudge factor" allowed). Either way, I'd like it to have a bit more "heft" than 6.5%. Overall, I am really glad this beer has made it to the shelves of our stores here. It's the first IPA available in our stores, believe it or not - therefore, a bit of a triumph for IPA-lovin' people like me. It is a respectable IPA - not the best I have had, but it can at least stand shoulder-to-shoulder somewhere in the middle of the pack with other Canadian IPA's available on the market - really, for their first go at this, that's saying something for the Gahan folks. Keep up the progression, gents! "there is a 1.5% fudge factor"
Are you sure about that? I thought it was +/- 0.5% abv. If a brewery needs a fudge factor of 1.5% abv, then their process is out of control. None the less, I agree with your review. This is a good IPA. The factor has nothing to do with Gahan. From what I have heard (I'd love to see it in writing), it is a provincial regulation and allowance - that 6.5% is the strongest beer that can be made, but that there's a buffer zone of 1.5%. If you can confirm / unconfirm, that'd be great! I will see if I can find the reference in Canada's Weight & Measures but it was my understanding that the beer must be within 10% of what is stated on the label.So 5% abv is to be +/- 0.5%. 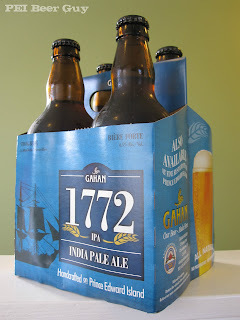 1772 is likely a reference to the origins of the IPA style. Very possible... I like my explanation, though, too... I'll have to get to the bottom of it this weekend! Do you know what kind of aroma hops they use in this? I don't know why, but the smell reminds me of the wild hops that grow on the Island: Sort of a grassy-watermelon kind of smell. I'm pretty sure there's some Centennial in there, but not quite sure what the total hop bill looks like.